You can Special Summon this card (from your hand) to your opponent's side of the field in Attack Position, by Tributing 1 monster they control. 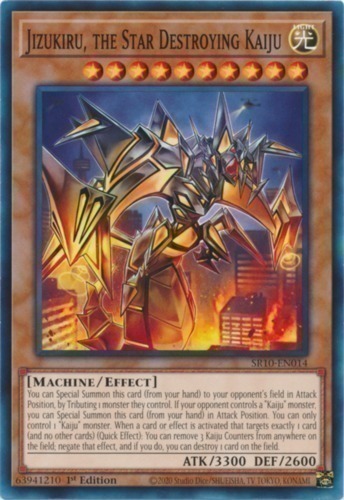 If your opponent controls a "Kaiju" monster, you can Special Summon this card (from your hand) in Attack Position. You can only control 1 "Kaiju" monster. During either player's turn, when a card or effect is activated that targets exactly 1 card (and no other cards): You can remove 3 Kaiju Counters from anywhere on the field; negate that effect, and if you do, you can destroy 1 card on the field.